The U.S. chairman of the Joint Chiefs of Staff, Gen. Joseph Dunford, right, and Turkey's Chief of Staff Gen. Hulusi Akar talk during a meeting in Incirlik Airbase in Adana, Turkey, Feb. 17, 2017. The chairman of the U.S. Joint Chiefs of Staff, General Joseph Dunford, met his Turkish counterpart Hulusi Akar Friday at NATO's Incirlik airbase in southern Turkey. Talks between the NATO allies reportedly focused on Washington's support for Syrian Kurdish militias in the fight against the Islamic State group. The United States says it chooses carefully among Kurdish fighters when lending its support to Syrian rebels battling Islamic State. Ankara dismisses the Americans' arguments and says they are actively supporting the People's Protection Units, the YPG, whose fighters the Turks contend are terrorists group united with the outlawed Kurdistan Workers Party, or PKK, fighting against the Turkish state. “It is the ultimate issue for Turkey, and if there is no movement as far as Turkey's requests and demands, it seems that this crisis issue between the two countries will remain,” Idiz added. U.S. Vice President Mike Pence likely will hear the same message when he discusses the fight against Islamic State on Saturday in Germany with Turkish Prime Minister Binali Yildirim. The two will hold talks on the sidelines of the annual Munich Security Conference. The United States and European Union agree on the PKK, which both have designated a terrorist organization. Washington maintains its military does not assist the PKK but does support the Syrian Democratic Forces (SDF) a coalition of Syrian Arabs and Kurds that has proven itself to be by far the most effective force against Islamic State extremists in Syria. 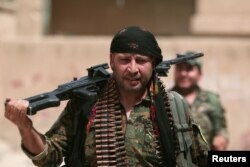 The SDF is a multiethnic and multireligious alliance of militia fighters opposed to the Syrian regime of Bashar al-Assad, but its military leadership comes from the YPG, and that is what has drawn Turkey's intense opposition. A Kurdish fighter from the People's Protection Units (YPG) carries his weapons as he walks the streets in the northeastern city of Hasaka, Syria, Aug. 21, 2016. Support from U.S. and European special forces, along with American air power, has enabled the SDF to advance to within a few kilometers of Raqqa, the large Syrian city that is the jihadists' self-declared capital. Experts say such comments are infuriating to Ankara, which has been intensely lobbying Washington to exclude the Syrian Kurdish militia from plans to capture Raqqa. Earlier this week, Defense Minister Fikri Isik declared Washington was moving closer to the Turkish position, after word came that the Pentagon is working on an action plan to defeat Islamic State, as ordered by President Donald Trump. Analysts point out that Ankara has so far failed to provide Washington a detailed alternate plan to using the Syrian Kurdish militia. Turkey's Defence Minister Fikri Isik answers a question during an interview in Ankara, Aug. 5, 2016. “I don't think personally that the American side and the allies supporting the Americans are going to change horses midstream unless there is some guarantee on what Turkey can do,” Idiz added. Experts warn Ankara is finding itself increasingly isolated over its stance of absolute opposition to the YPG and its political wing, the PYD. “Turkey has a very weak hand,” warns international relations specialist Soli Ozel of Istanbul's Kadir Has University. Ozel, who says Ankara could temper its hostility, pointed out that Erdogan reaffirmed his position that the YPG is nothing but a terrorist organization after a meeting he had earlier this month with German Chancellor Angela Merkel. Ankara still has some cards to play with Washington, since Turkey shares a long border with Syria and U.S. forces depend on Turkish airbases for operations against IS. Regional experts warn Ankara could also play spoiler to U.S. military plans to capture Raqqa, by sending Turkish military forces toward the Syrian town of Manbij. The town was liberated by Syrian Kurdish forces from Islamic State, and any battle for its control could see the YPG pulling out of an offensive against Raqqa in order to defend it.